Much has been written about “seeing the end result.” In other words, envisioning the end-result in your mind’s eye. I’ve done some of that writing, and I’ll do a bit more here . . . because that creative process is so very important, especially when it comes to HDR imaging, which is a current favorite topic of mine (and the subject of my next book). With HDR imaging, it’s important to see and understand the brightness/contrast range in the scene. The greater the contrast range, the more exposures you need to take over and under the recommended (average) exposure setting. For the opening image in this article, I took three exposures with my Canon 5D and 24,105mm IS zoom lens – mounted on a INDURO tripod. 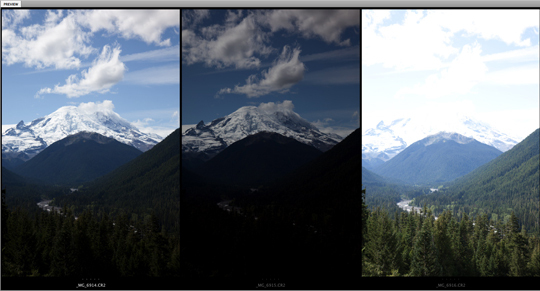 Those three shots (0 EV, -2 EV and +2 EV) captured the entire brightness range, as you can see in the example below. Had the contrast range been greater, I would have needed to take more exposures over and under the recommended setting. As you can see, the original images are in color, but my end-result image is in black-and-white. That’s because I envisioned the end-result. While driving along the road with my friend and DPE’s co-founder Juan Pons to a workshop at which we were teaching, I noticed this beautiful view of Mt. Rainier. We pulled the car over to the side of the road and shot from the shoulder – as cars speed by us, the drivers not noticing the spectacular view. 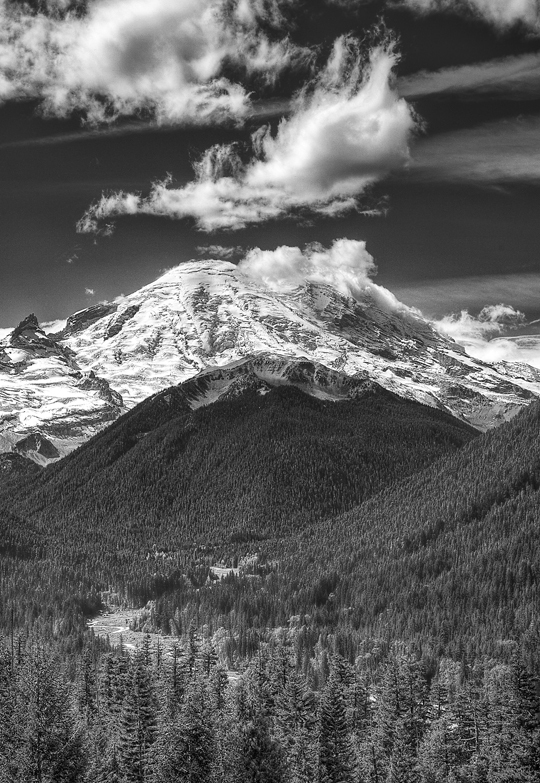 Thinking of Ansel Adams and his signature landscape photographs, I envisioned the end-result in black-and-white. So, after processing my images in Photomatix, I coverted the image to a black-and-white using Nik Software’s Silver Efex Pro – which I feel is the best way to get a black and white image. I was a bit lucky with this image. Two factors came together in my favor: a clear day and beautiful clouds. Envision the end result, and you’ll be on your way to being more satisfied with your images. If you like HDR and black-and-white imaging, you can get a discount on Photomatix and Silver Efex Pro (and several other plug-ins) at the Plugin Experience (http://www.pluginexperience.com). 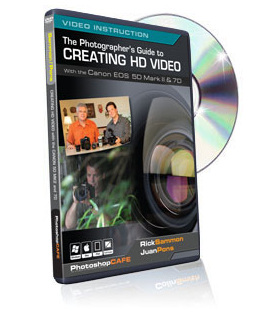 Juan and I will be covering HDR and landscape photography on our traveling seminars. Here is the current info. Please keep checkin’ this site for info. We hope you can envision the fun you’ll have and the digital photo experience. I will be teaching HDR on my St. Augustine workshop in January. Info click here! Good post, and great point! For a while when I first started playing with HDR I’d shoot, return home to process, and not be happy with my results. As I got further along my own learning curve though I hit that point when I could look at a scene and actually see what the HDR would work out to be. You can get to that point. One of my favorite shots, an old Taxi in the ghost town of Lowell, AZ., ended up being a 6 exposure HDR just because I knew the result I wanted. And after only one set of shots I knew I had the image I wanted for the day. Looking forward to reading more on the subject here! Doing a B&W HDR never even crossed my mind… looks like I’ve got a new project. I chanced upon your site via a comment from another blog and am happy I did. Great stuff you’ve got here…not sure if it’s a bug or not but the sidebar seems a little out of sync in Chrome. Bah – I should use IE and stop complaining. Cheers! Interesting, I just checked the site on Chrome for OSX and everything looks fine… Can you send a screenshot? This is the best example of HDR I have seen! I have stayed away from HDR because I hated the obvious unnatural appearance of most HDR photos. You have made the technique fit the image for sure. 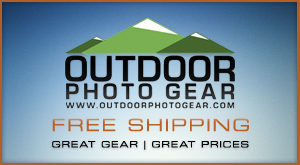 As an avid photographer, I’m happy to have found your website. It’s always nice to see other’s work and get new ideas. Check out my site if you’d like.